The process of warming food that has been frozen so that the food can be eaten or prepared to be served. As food warms, it become susceptible to bacterial growth so it is wise to understand that different foods should be thawed at different lengths of time and may require different methods for the thawing process. For example, frozen meats, fish, fruits, raw dough, prepared entrees, and vegetables should be defrosted in the refrigerator to limit the harmful bacteria that would build up if the meat were defrosted in a warmer environment. Place a container under the item being thawed in order to catch any moisture or juices that are released due to thawing. Large cuts of meat or poultry may require a longer amount of time for thawing in the refrigerator. To speed up the thawing time for food such as a 10 to 15 pound turkey will require a water bath in cold water, keeping the water cold to safely thaw the turkey before placing it back in the refrigerator to keep until it's ready to prepare soon after thawing. Other items, such as breads, cakes, cookies, and pastries can be safely defrosted in their wrappers at room temperature. Not all foods need to be placed in the refrigerator or on the counter for thawing. As an example, foods that will be eaten immediately after thawing, can be warmed in a microwave if placed on the indicated setting for defrosting before being cooked. Similarly, frozen vegetables can be placed in boiling water immediately after being removed from the freezer as a method of thawing. After any food item has been thawed, it is best to prepare it the same day it is thawed, particuarly if it was refrigerated first, and then frozen. A concern may occur when considering to refreeze an item while it is being thawed. 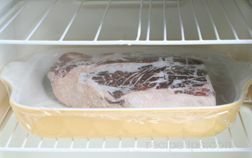 To safely refreeze foods that have been thawing requires a dermination that the temperature of the food being thawed has not reached a temperature below 40º F. If the food has thawed outside of a cold bath or a refrigerator, there is a good chance that the outside layer has warmed above 40º F, so for safety purposes, do not refreeze the food. Always be aware that foods which are refrozen will often lose flavor and generally have some loss of texture, becoming more mushy, and less crisp or less firm in consistency.